Playing Outdoors In The Spring. 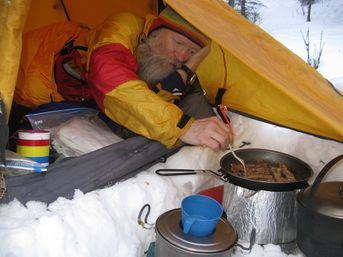 The Copper Basin 300 is held in early January every year. It attracts dozens of mushers from all over the state who come here to train their teams and qualify to run in the Iditarod which starts on the first weekend of March. Find out more about the Copper Basin 300 at CB300.com. 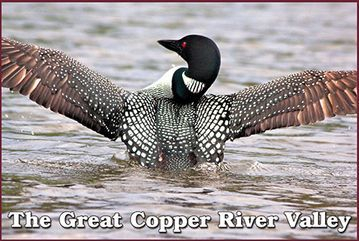 When you come to the Copper River Valley in the summer, you're actually here in the "off-season." The norm is winter. This is a cold, wintery place, where the average temperature, rounded out, is 3 degrees below freezing. This doesn't mean that it's actually 29 degrees every day. In the summer, the temperature can climb into the low 70's or even the 80's. But sudden frosts are possible any month of the year, including June and July. Snow can come as early as late August and September in the higher elevations of the region, and there can be ferocious blizzards well into April. But the longer daylight hours make March and April a perfect time to get outdoors and play. You can still ski and snowmachine and the sun is so bright you have to put on sunscreen. Sometimes snow is still on the ground in shaded spots in June at Thompson Pass and on the Denali Highway. And large lakes are slow to break up - often still covered with rotten ice, into June. There's no doubt about it. Alaska is a wintery place. Local people have to work hard to keep their homes well-insulated and heated to deal with temperatures that are considered a novelty in "The Lower 48." Here, it's the real deal. Imagine what the "wind chill" is like when it's actually 60 degrees below zero! It's nothing to brag about, like weathermen do in the Lower 48 when it's a cold, blustery day – meaning 25 degrees above zero with a wind. With these kinds of temperatures, safety is always important. 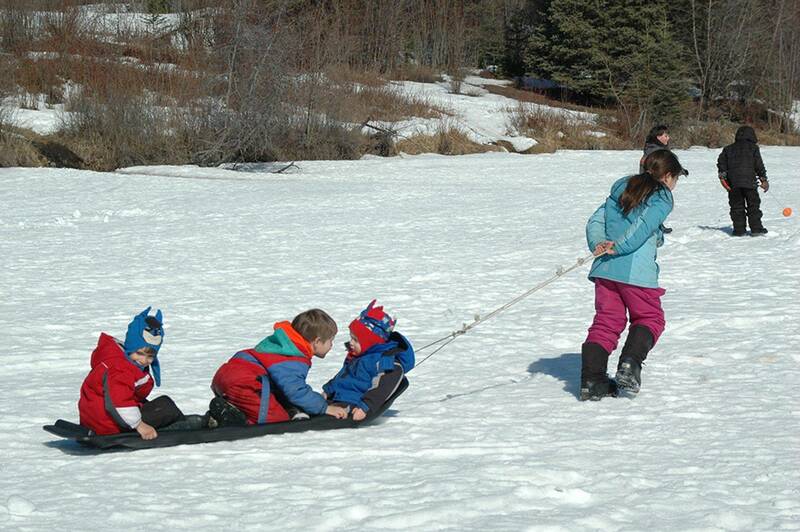 But, local people do have fun, too, in the winter. The Copper Basin 300 Sled Dog Race, held in early January every year, starts off Alaska's dogmushing season. 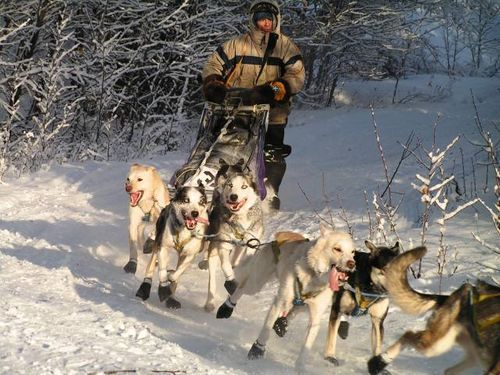 It's a 300-mile long qualifying race for the more famous Iditarod Race, which takes place several months later. Alaska sled dogs are habituated to low temperatures. After all, this is where they came from. And they thoroughly enjoy the event, which goes from lodge to lodge, cross-country, through some of the most vigorous sled racing territory in the northern world. 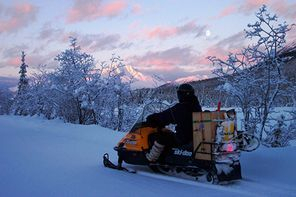 The Ahtna Native residents of this region were skilled artisans who turned furs from caribou, moose, and other wild animals into durable, warm clothing. Later, incoming miners and settlers mainly used wool and canvas for their clothing. 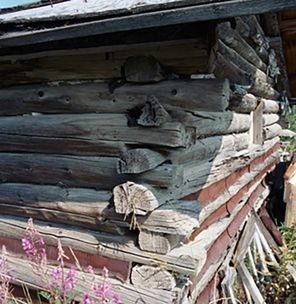 Back in the early 20th century, when only logs were available for building homes, the cracks (or "chinks") between the logs left a lot of space for the outdoors to come in during the wintertime. Desperate homeowners used anything they had available to act as chinking: old newspapers, burlap sacks, brown paper, socks... and even pieces of cut-up Blazo fuel cans. This is an old Copper Center cabin, chinked with metal cans, nailed over the gaps in the wall.